Grilled Glazed Salmon, Thyme for Cooking fish from the barbecue. In small bowl mix all ingredients except salmon and lemon. 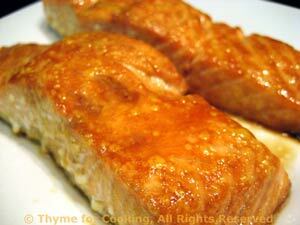 Drizzle over salmon and allow to marinate for 15 minutes. Put salmon in a grill basket if using barbecue grill or on mesh grill pan if you don't have a basket. Grill for 10 - 12 minutes, skin-side down, with the grill cover closed. Be careful not to overcook. OR put on baking sheet and roast in 400 F oven for 15 - 20 minutes, depending on thickness. In both case salmon will be done when it flakes easily, slightly pink in the center is fine. Remove from heat and slide the salmon off the skin if needed.